The Prussians were Western Balts who were closely related to the Eastern Baltic tribes of Lithuania and many of those in Latvia. Baltic people have lived around the shores of Mare Suebicum, the Baltic Sea, and as far east as Moscow for several thousand years, arriving as Indo-European proto-Baltic peoples around 3000-2500 BC. They initially formed part of a general westwards migration of Indo-Europeans until splitting off around that time. They further divided from the closely-related Slavic group around 2500 BC and went on to form the ancestors of the Latvians, Lithuanians and Old Prussians. The Old Prussians formed the bulk of the Western Balts, although there were a few other Western Balts who fell outside this classification. The Prussian name which was used as an umbrella term to describe most of the Western Balts first emerged in the ninth century AD. The form of 'Bruzi' was recorded by a Bavarian geographer some time after 845. Before the ninth century 'Prussian' is believed to have been the name of one of a specific western Prussian tribe and was only gradually transferred to other tribes, just like the tribal name 'Allemagne' was used by Franks to describe all of Germany. Around 965 an Arab trader from Spain, Ibrāhīm-ibn-Jakūb, who visited the Baltic Sea, spoke of Prussians (Brûs or Burûs) as having a separate language and being very courageous in wars against the Vikings ('Rus'). Old Prussian river and place names, although strongly Germanicised and then Slavicised, cover the whole area between the Vistula and Nemunas rivers. Some names which are presumed to be Baltic are found even to the west of the Vistula, in eastern Pomerania. From the archaeological viewpoint there is absolutely no doubt that, before the appearance of the Goths in the lower Vistula area and in eastern Pomerania around the first century BC, these lands belonged to the direct ancestors of the Prussians. The Old Prussians were also neighboured by the Venedi in the last few centuries BC and perhaps AD. By the tenth century AD various tribes could be distinguished in Old Prussia, including (from east to west) the Sudovians, the Skalvs (otherwise known as Skalvians, Scalovians, Skalwen, Schalmen, or Skalowite), the Nadruvians (Nadruvs or Nadruwite), the Sambians (or Sambite, of what became Samland, but the same as Zembs, below), and the Natangians (Nattangi), all now within Kaliningrad. Then there are the Warmians (Varmians or Varmienses, of what became Warmia), the Bartians (or Barthi), and all but the northern area of each of these is now in Poland), the Galindians (not strictly Old Prussians at first, but certainly Western Balts, and later the surviving groups were classed as Old Prussians), the Pogesanians (Pogesani) and Pomesanians (Pomesani - both of what later became Pomesania), the Lubavians, and the Sasna, (all now completely within Poland). The Yotvingians (Yatvyags) and Zembs (not the same as the Zhemaits) were further to the south and east. 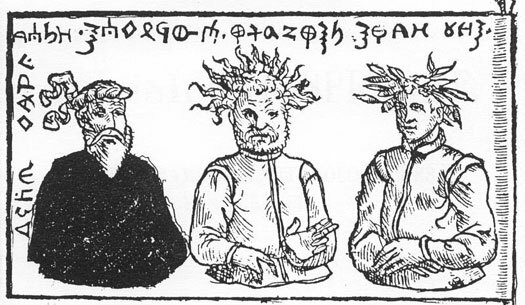 The Yotvingians were identical with the Sudovians. Despite their seemingly dislocated location, the Zembs were identical with the Sambia, the latter being an international spelling of the original Baltic name. The Skalvs and Yotvingians were almost completely annihilated by the Teutonic Knights in the thirteenth and fourteenth centuries, and uninhabited areas appeared on the borderlands between the Order and Lithuania. Parts of Zhemait territory such as Zhasino later became part of Lithuania. Kulmerland was a south-western tip of Prussian territory which was encircled by the River Vistula to the west and the Drewenz to the east. This later became the bishopric of Culm. The Bartians are remembered in the name of the modern city of Bartoszyce. To all intents and purposes the Prussians were destroyed as a recognisable people by the Teutonic Knights, although some survived by crossing the eastern border and merging with the Lithuanians. By the seventeenth century, East Prussia was an entirely Germanic state, while West Prussia remained a Polish possession until 1772. Unsurprisingly, the Prussian languages also did not survive. Old Prussian finally disappeared around 1700 due to the German colonisation of East Prussia. By this date, Estonia, Finland, Latvia, Lithuania, and Prussia are settled by pre-Baltic hunter-gather tribes which all share the same cultural traces. They belong to two groups, one being the regionally-dominant Baltic Kunda culture, which is a development of the earlier Swiderian culture which itself is located on the eastern edges of the later Prussian territory. The other is the Magdalen-Ahrensburg culture located in north-western Germany and Denmark, which probably enriches the Kunda culture. 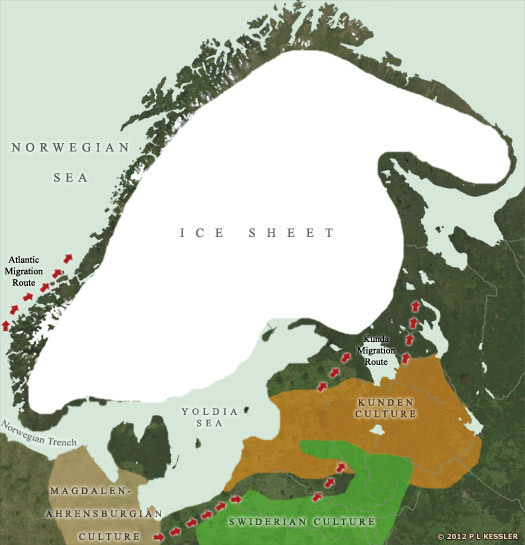 Traditional scholarly belief has these hunter-gatherers migrating from the southern Baltics and further east, but a more recent idea suggests that while this is correct for the Baltics, Finland and northern Scandinavia are also first inhabited via the sweeping grass plains of Doggerland (now under the North Sea). The waters of the ice-damned Baltic Ice Lake penetrate the region of the Billingen Mountains to form a link with the Atlantic Ocean. As a result, the Yoldia Sea drops rapidly, by about thirty metres. 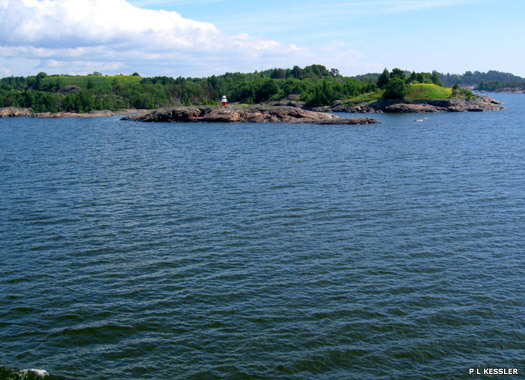 This retreat is so sudden, and probably has such a profound effect on the early inhabitants of the Baltic area, that it is known as the Billingen Catastrophe. The Preboreal period sees the climate become significantly warmer in the Baltics. Birch and pine forests start to spread, and elk, bears, beavers, and various species of water birds migrate into the region from the south. The Boreal period sees the climate continue to warm and become drier. Pine forests decrease, allowing deciduous trees to gain a firmer foothold and become prevalent. The animal population thrives, with red deer, roe deer, and hares increasing considerably. The Atlantic period is characterised by a climate that is warmer than that of the present day. New species migrate into the Baltic region, including Baltic aurochs and wild boar, which inhabit forests of broad-leaved trees. Water chestnuts grow in the many lakes, and the bountiful life draws hunter-gatherers into the area. The warmness fails towards the end of this period, causing the disappearance of aurochs, wild horses, and water chestnuts. The Comb Ceramic culture reaches Prussia, Latvia, Estonia and Finland as new peoples arrive from the east, almost certainly the Finno-Ugric tribes who form the later core of Finland and Estonia (Estonians, Finns, Livs, Karelians, Wots, Weps, and Ingrians). 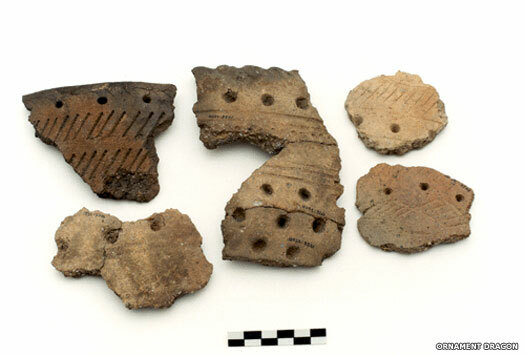 This Neolithic culture seems to form on the basis of the previous Mesolithic cultures, but uses a greater variety of bone, antler and stone implements, and employs boring, drilling, and abrading skills. The Mesolithic Nemunas culture of southern Lithuania is replaced by the Neolithic Nemunas culture. The Corded Ware culture (or Boat Axe culture) arrives in southern Finland, along the coastal regions, as well as in Estonia, Latvia, Lithuania, Belarus, western Russia, Poland, northern Germany, Denmark, and southern Sweden. These new, probably early Indo-European, arrivals also have some domesticated animals and bring agriculture with them, although they continue to exist alongside universally-practised hunter-gather activities for some time. Both of these groups - foragers and farmers - form the proto-Baltic ancestors of the later Latvians and Lithuanians. In the Bronze Age, prior to expansion of the central European Lusatian culture around this time, the Western Balts seem to cover the whole of Pomerania to the lower Oder, and what is now eastern Poland to the Bug and upper Pripet basins in the south. Archaeology later shows that the same culture can be found here as the one that is widespread in ancient Prussian lands. The southern extent of the Prussians along the River Bug, a tributary of the Vistula, is indicated by the Prussian river names. Ptolemy, who writes in the mid-second century, records the existence of the Galindai and Soudinoi tribes, the later Galindians and Sudovians. 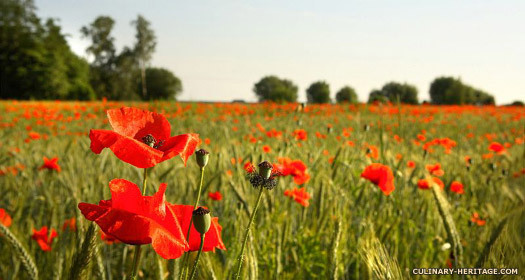 Both of these are Western Balts, but not Old Prussians, although they do closely border the Old Prussians to the south. The fact that these names already exist show that Prussian tribes (and probably the other Baltic tribes) have their own names and that they survive virtually unchanged for the next millennium. In this century Swedish forces establish strongholds at Truso and Viskiautias (Wiskiauten or Viskiautai), in the territory of the Prussians. The latter stronghold is located at the south-western corner of the Courish Lagoon in northern Samland, and is the gateway for the traffic leading to the east via the lower Nemunas basin into the lands of the Couronians, Lithuanians, and other Baltic tribes. 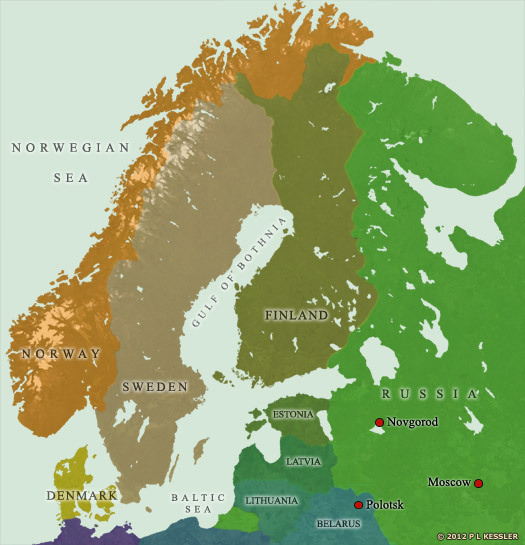 According to some sagas, Scandinavian kings are likely to rule over all the countries on the eastern shores of the Baltic, although in reality this probably means various strongholds and trading centres along the coastline. The traveller and trader, Wulfstan of the Viking trading site of Hedeby in Danish Jutland, while visiting the Prussian lands around this time, witnesses many 'towns', each with its king. There are clear indications that the feudal castles, as defence posts for the growing towns, have already come into existence in the period between AD 500-800, and have subsequently become the centres for larger administrative units. The formation of the feudal system has already been accomplished by the time of Wulfstan's visit. Semi-legendary chieftain of the Prussians. Boleslaw IV of Poland attacks the Prussians with the aid of Russian troops, but is unable to conquer them. Under the Polish Prince Konrad of Mazovia, attempts to conquer the Prussians are intensified, with large battles and crusades taking place in 1209, 1219, 1220, and 1222. The Golden Bull of Rimini is issued by Frederick II, giving the Teutonic Knights wide-ranging powers in the name of the Holy Roman empire in Prussia. Prince Konrad of Mazovia in Poland invites the Teutonic Knights to settle in the Lower Vistula on the border with the Prussians, who have been ravaging Mazovia, part of which occasionally includes their region of Chełmno. Over the following decade, the Prussian lands are swallowed piecemeal, as the Order uses its successful tactic of building a stronghold, pacifying the immediate territory, and then advancing to repeat the process. The dispersed and tiny lands of the Prussian tribes are an easy conquest. By 1237-1238, Pamedė (of the Pomesanians) and Pagudė (of the Pogesanians) are already under the Order's rule. Next, the Teutons push on along the Frisches Haff and in 1240 defeat the united Bard (Bartians), Natangians, and Warmians. In 1241 the conquered and newly-baptised Prussians, no longer able to stand the oppression of the conquerors, rise up in revolt, but they are defeated by 1249. Following this interruption, the Order continues its advance to the north, intent on forming its own military-religious state (known as the Ordenstaat) which it governs for the next three hundred years. The Papal legate, William of Modena, oversees the creation of the four dioceses of Culm, Ermland, Pomesania, and Samland within the recently conquered Prussian territories. Emland became a diocese within the Prussia of the Teutonic Knights (known as the Order). The Papal legate, William of Modena, oversaw the creation of the diocese in 1243, along with those of Culm, Pomesania, and Samland. It was a semi-independent ecclesiastical state which fell under the jurisdiction of the archbishop of Riga. During this period, while the native peoples of Livonia and Lithuania were consolidating into recognisable modern peoples, the inhabitants of Prussia were in a dismal state. Treaties signed between the Prussians and the Order had not been fulfilled; the Prussians were forbidden to live in towns, and they were driven out of their native areas and moved to the eastern districts of the state. Large numbers of Prussians died and their farms were destroyed during the crusade, with almost all the western and northern Prussian provinces now being under the control of the Order, and also in the revolts of 1260-1274. The Order ordered the colonisation of Prussia by German peasants with the result that the few Prussians who survived found themselves surrounded by Germans and were gradually assimilated. It was only in Samland with one of the heaviest concentrations of Balts that they constituted a majority. Heinrich von Strateich is elected to be the first bishop of Ermland, but he does not take up the office. Instead, his replacement, Anselm, becomes the first bishop of Ermland to enter the region and perform the duties of his office. The Teutonic Knights take northern Prussia, with the result that the bishopric of Samland is formed there, comprising the Frisches Haff (Vislinskii Zaliv) and Kurisches Haff (Kurskii Zaliv), with Königsberg serving as the administrative headquarters. The inhabitants of Prussia are in a dismal state by this time. Treaties signed between the Prussians and the Teutonic Knights are not fulfilled; the Prussians are forbidden to live in towns, and they are being driven out of their native areas and moved to the eastern districts of the region. The Livonian Knights, along with the Teutonic Knights, are abandoned by their Estonian and Couronian vassals and defeated again, this time severely, at the Battle of Durbe in Livonia by the Samogitians. As a result, numerous rebellions break out against the Teutonic Knights all across the Baltics, including a general uprising throughout Prussia. The Prussians win several battles against the hard-pressed Knights and by 1264 the situation is critical. Reinforcements arrive from Germany and the Order launches an attack against the rebels who are led by Henrich Mantas, with final defeat of the Prussians coming in 1274. Several uprisings occur in the thirteenth century, but none as serious as this. The Teutonic Knights continue to advance north, and having conquered the lands of the Skalvs and part of that of the Yotvingians, they drive the Nadruvians to the River Nemunas in 1283, right on the border with Lithuania. The population of these areas is slaughtered, with only a few managing to escape across the border. Nadruvian lands become deserted. Being divided into many small principalities and unable to organise a united army of all the Prussian people, they have been unable to hold back the increasing numbers of their enemy. Teutonic castles, superior to Prussian ones, cover the whole territory of the Prussian tribes by the end of the thirteenth century. The last of the Old Prussians to fall as a result of continuous wars with the Poles of the eastern province of Masuria and Germans in the last quarter of the thirteenth century is Sūduva, the land of the Sudovians (Yotvingians). After the loss of nearly two-thirds of the Prussian territory in the south due to Rus and Polish expansion before the thirteenth century, and after a tremendous loss of life in the wars with the Germans, only some 170,000 Old Prussians are left. On the Samland peninsula, the previously most thickly populated area, their number is reduced to a mere 22,000. In 1290 the bishop of Courland re-enters his territory following the successful suppression of the Baltic rebellions. However, in the same year the cathedral chapter is incorporated into the territory belonging to the Teutonic Knights, resulting in the bishopric being subject to the Order, and many of its incumbents being members of the Order. The same process has already been forced upon the dioceses of Prussia, with the exception of Ermland which maintains its independence. Neiße is Nysa in Poland. 'Pope' to the Balts of Couronia, Lithuania, Prussia, & Semigallia. Peter von Dusburg writes that in the Prussian province of Nadruva, in the place called Romuva, there is a powerful priest named Krivė, whom the people regarded as pope, and whose dominion extends not only over Nadruva, but also over Couronia, Lithuania, and Semigallia. The only such 'pope' known to recorded history, Krivė is highly respected by the kings, nobility and common people, and his rule covers almost all of the Baltic lands during the wars a gainst the Teutonic Knights. The position is vacant for over two years. Coincidentally, perhaps, at the end of this period, in 1337, Duke Otto IV of Carinthia founds the Societas Templois Order of knights to play a part in the suppression of the Prussians and the conquest of the Lithuanians. 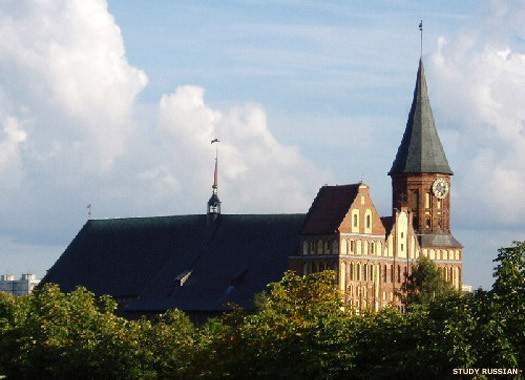 The seat of the bishop of Emland is moved temporarily to the medieval town of Orneta. The town had only been incorporated in 1313 and it includes the Gothic parish church of St John the Baptist near the main square. This is built in the same century and is later expanded in the fifteenth century. It has a basilica construction that is seldom seen in Warmia, which means that its main nave is twice the height of the side naves. Attached to the main nave is a ring of chapels, and the church's interior is richly decorated, mostly in the Baroque style, but the south nave also contains medieval paintings. In 1356, the bishops of Ermland became imperial prince-bishops under Holy Roman Emperor Charles IV. The prince-bishopric was, in practice, semi-independent, although it covered only about a third of the entire diocese. The rest of the diocese was under the control of the Teutonic Knights until 1525 and then the dukes of East Prussia. By now, Ermland in its German form was being written as Warmia, a more Polish Latinised form of the name. Later Pope Pius II (1458-1464). At the conclusion of the Thirteen Year War, along with the Teutonic Knights, the bishopric of Warmia falls under the suzerainty of Poland and German prince-bishops are replaced by mostly Polish archbishops, although the congregation in the northern part of the diocese is still German. Warmia becomes an exempt bishopric, removing it from regional control and placing it under the direct jurisdiction of the Pope. 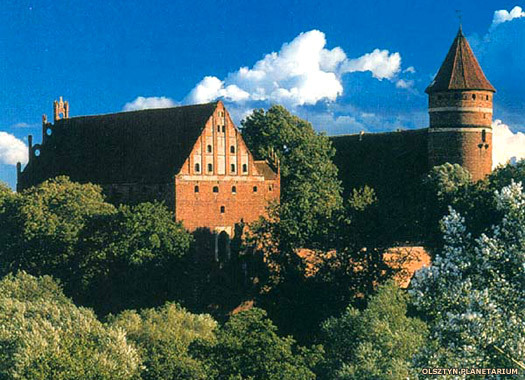 The Teutonic Knights' Ordenstaat is secularised and converted to Lutheran Protestantism as the duchy of East Prussia, although Warmia remains a catholic archdiocese. In the same year, the reverberations of the Peasants' War in Germany reach Prussia. The duke of East Prussia, Albert Frederick, dies without an heir and the territory is inherited by the senior Hohenzollern line in Brandenburg. Much of Prussia is united to the German electorate. The line of bishops of Warmia continues during the Swedish period in Prussia. Hostilities between Poland and Sweden flared up in 1617, but this time the reorganised Swedish forces were unstoppable, taking Riga and pushing into Lithuanian and Polish territories. The Treaty of Altmark in 1629 concluded the First Polish-Swedish War by recognising the Swedish capture of most of Poland's southern Estonian and Livonian territories, with Poland retaining just Latgallia in the east of Livonia. Poland was also forced to temporarily cede the port cities of Braunsberg (Braniewo in Ermland), Elbing (Elblag), Memel (Klaipeda), and Pillau (Baltiysk). The territory was termed Swedish Prussia, and Swedish governors-general were appointed to manage it (shown in red). They became part of the front line during the Thirty Years' War, which began in 1630, often commanding large swathes of Sweden's forces outside Scandinavia. The bishops of Warmia continued to hold their own post, and the list of them continues here from 1635 onwards. Lord High Chancellor of Sweden. Regent (1632-1644). Sweden enters the Thirty Years' War in summer 1630. As part of the military funding, tolls and food supplies secured in Swedish Prussia are pivotal assets. The first major victory of the Protestant forces in the war is at the Battle of Breitenfeld in September 1631, which ensures that the northern German Protestant states will not be forced to reconvert to Catholicism. The forces of Sweden and Saxony force the Catholic League's line to collapse, and serious casualty numbers are inflicted on the armies of the Holy Roman empire, Hungary and Croatia. Tragically for Sweden, the king is killed at the Battle of Lützen on 6 November 1632. Axel Gustafson Oxenstierna, governor-general of Swedish Prussia, becomes supreme commander of the Swedish troops in Germany and then regent for the king's daughter, Christina. Acting governor-general for the second time, Apr-Aug only. Later governor of Livonia (1643). Poland regains Swedish Prussia, first with Memel in July and then the remainder in September. The line of bishops of Warmia has continued in the meantime without interruption. Successor to Prince-Bishop John Albert Vasa. The village of Stoczek Klasztorny (also known as Stoczek Warmiński) had been established in the mid-fourteenth century. Bishop Mikołaj Szyszkowski now builds a rotunda there as a votive offering for the Polish victory in the war against Sweden. Around this is built a Sanctuary of the Holy Mary. The electorate of Brandenburg-Prussia is elevated to a kingdom by the Holy Roman Emperor, the first German state to be raised in this manner. The First Partition of Poland-Lithuania takes place on 5 August, removing large swathes of the commonwealth from Polish control. Warmia and parts of Great Poland are taken by Prussia (as West Prussia). The position is vacant for five years in a period which sees the kingdom of Prussia conquered by Napoleonic France (1806). Died 1947 as exiled bishop. The bishop's seat is left vacant following the conclusion of the Second World War and the expulsion of the German population by the Soviet Russian victors. This expulsion includes the German bishop, with the result that the position remains vacant in Poland until a new Polish diocese is formed in 1972. The diocese is elevated to an archdiocese. The Teutonic Knights' Ordenstaat was secularised and converted to Lutheran Protestantism in 1525, with the new name of the state, Prussia, being selected after the name of the indigenous people. Unfortunately, that indigenous people, the Prussians, were fast becoming extinct in cultural and linguistic terms. By the end of the seventeenth century, Prussian as a spoken language had disappeared completely and the Prussians as an ethnic group had also disappeared. Albrecht von Hohenzollern, margrave of Brandenburg-Kulmbach, was closely related by birth to the Hohenzollern electors of Brandenburg, and for a while the two territories were separately run by these two main branches of the family. East Prussia remained under the control of first Albrecht and then Albert Frederick of Hohenzollern, but unification of the two states followed in 1618. The Teutonic Knights, ousted entirely from power, remained as mere titular administrators, supported by the Holy Roman Emperor who continued to hold a claim on Prussia. Former grand master of the Teutonic Knights. The bishopric of Samland is dissolved and the territory is submerged within East Prussia. The bishopric of Pomesania is dissolved and the secularised territory is submerged within East Prussia. Albert Frederick dies without an heir and the territory is inherited by the senior Hohenzollern line in Brandenburg. The two are united, and East Prussia remains under German control. In 1773 the now totally-Germanised state is reorganised as the province of East Prussia within the kingdom of Prussia. Following the conclusion of the First World War, West Prussia is absorbed by Poland, but East Prussia remains an internationally-recognised German enclave until the end of the Second World War, when it is occupied by the Soviet Russians. Kaliningrad is an enclave of territory on the eastern Baltic coast which is sandwiched between Poland to the south and west, and Lithuania to the north and east. It was annexed from Germany following the conclusion of the Second World War by the victorious Soviet Russians and was turned into a military zone. For seven hundred years before that it had been a German possession, carved out of the lands of the former pagan Prussians and other related tribes by the Teutonic Knights. Now, the region is administered by Russian governors who are appointed by Moscow. The victorious Soviet Russians take the northern section of East Prussia, including the region of Samland, and annexe it directly to the state. The southern half, which includes the regions of Culm and Pomesania go to Poland. The German population either flees or is expelled and is replaced by an imported Russian and Belarusian population. The capital is renamed from Königsberg to Kaliningrad, and the entire region remains a closed military zone throughout the Soviet period. Memel (Klaipeda), to the north, is incorporated into Soviet Lithuania. The Soviet empire collapses, and neighbouring Poland and Lithuania become independent states. Kaliningrad remains directly part of Russia, but the reason for its existence as a heavily fortified military base of massive proportions is ended and it becomes an isolated enclave and an almost forgotten backwater in Europe. Born in the village of Simskoe in 1931. Born in Moscow in 1938. Former admiral of Baltic Sea Fleet. Lithuania joining the European Union in 2004 means it is impossible to travel overland between the Russian enclave in Europe and the rest of Russia without crossing the territory of at least one EU state. This causes friction, particularly with Lithuania, over transit regulations. As an attempt to take its travel needs out of EU hands, Russia inaugurates a new sea route linking the region with Ust-Luga, near St Petersburg, in 2006. Born in Moscow in 1963. Kaliningrad undergoes a massive economic boom, with a modern airport terminal being opened in this year.